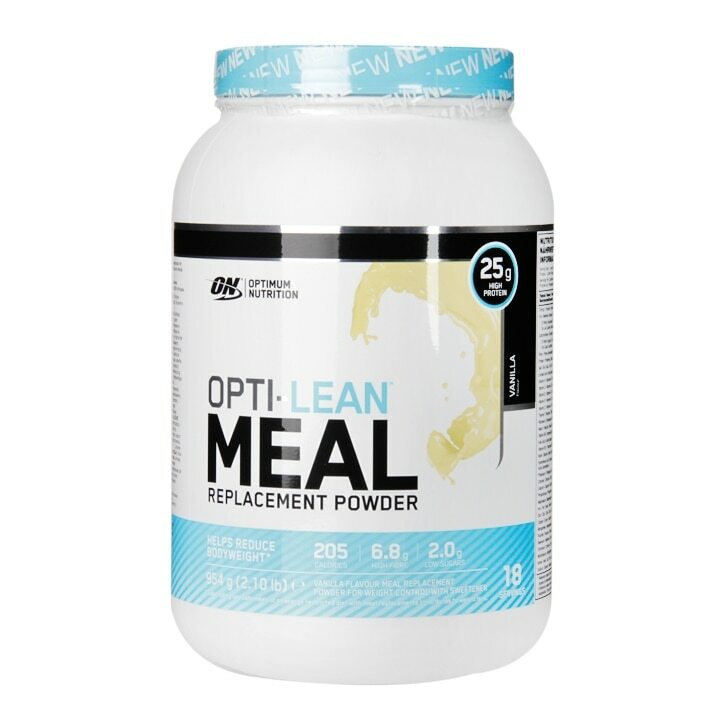 Opti-Lean Meal Replacement Shake provide fast and slowly digesting proteins in a powdered meal replacement product that mixes easily, tastes great and contains 7.3* grams of fibre and with high quality carbs sources from oats, flaxseed & chickpeas. Protein Blend (Whey Protein Concentrate (Milk), Micellar Casein, Emulsifier: Soy Lecithin), Oat Fibre, Oat Flour, Chickpea Powder, Medium Chain Triglyceride Powder (Milk), Inulin, Ground Flaxseed, Flavouring, Sunflower Oil, Di-Potassium Phosphate, Thickeners (Guar Gum, Xanthan Gum), Colour (Beetroot Red), Tri-Calcium Phosphate, Vitamin & Mineral Blend (Sodium-L-Ascorbate, Ferric Pyrophosphate, DL-Alpha-Tocopheryl Acetate, Nicotinamide, Zinc Oxide, Retinyl Acetate, Calcium D-Pantothenate, Sodium Fluoride, Manganese Sulphate, Cyanocobalamin, D-Biotin, Chromium Chloride, Potassium Iodide, Cholecalciferol, Folic Acid, Sodium Selenite, Copper Citrate, Pyridoxine Hydrochloride, Thiamin Hydrochloride, Phytomenadione, Riboflavin, Sodium Molybdate), Sodium Chloride, Magnesium Oxide, Acidity Regulator (Citric Acid), Sweetener (Sucralose). To be used in the framework of a varied and balanced diet and a healthy lifestyle. Use only as part of an energy-restricted diet, other foods should be a necessary part of such diet. It is important that the preparation instructions are followed. It is important that an adequate daily fluid intake is maintained. Optimum Nutrition Opti-Lean Meal Replacement Powder Vanilla is rated 4.2 out of 5 by 25.